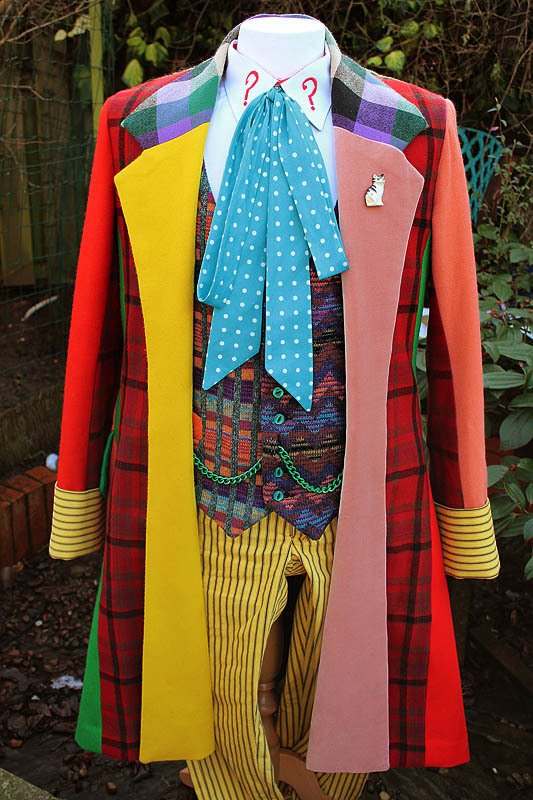 Now that I have completed Phase One - assembling the body of the test coat - I can now embark on phase two, setting the collar and lapels and lining the coat. Although I cut the pattern for the coat in one go, I left the collar and lining pattern until this point so that any problems could be resolved before proceeding. As it happens all has gone well so far, but it was still as well to wait. The collar and lapel draft are a little tricky, due to the unique roll line running right down to the hem. I had provisionally included the lapel facing in my pattern block to make sure it would work – you can see part of the lapel shape on the right-hand side of the block (see left). I will now redraw it in full to create my pattern. The lining is going to have to be a little unusual, as I will need to pattern it in its entirety, not just for the pieces adapted from the body of the coat. The skirt of the body is made from five panels each side, and this will be vastly simplified for my pattern, plus I need to plan in the internal pockets, which are surpassingly minimal and basic in design. More on that later. I first take my block for the coat body, and retrace the common parts: the back, coat tails, side panel and area of the front. 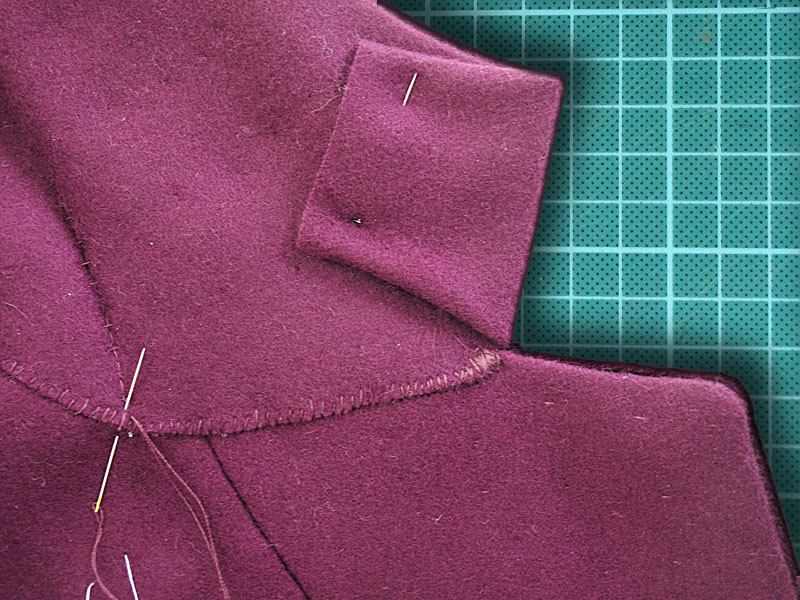 The lining for the skirt needs to be split at the side seam. This is the back edge of the panel with the outer pocket. I cannot simply trace the existing lines, as I need to make sure my hem circumference matches the body, so there's a bit of jiggery-pokery to crib the combined curve from the skirt panels. 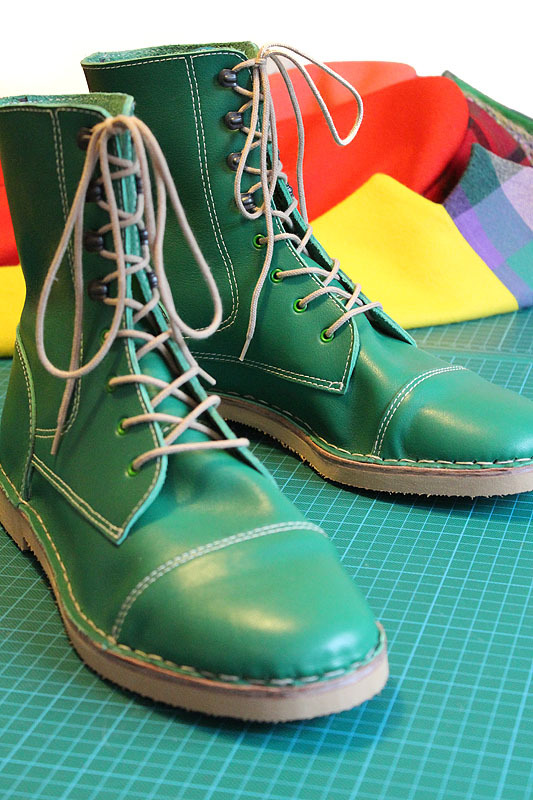 Giving you a sneaky preview of the finished coat, you can see the outer seams (above, left) highlighted in green, compared to the lining seams (above, right). the two narrow triangles of the skirt have been combined into the wider panels adjacent to them. 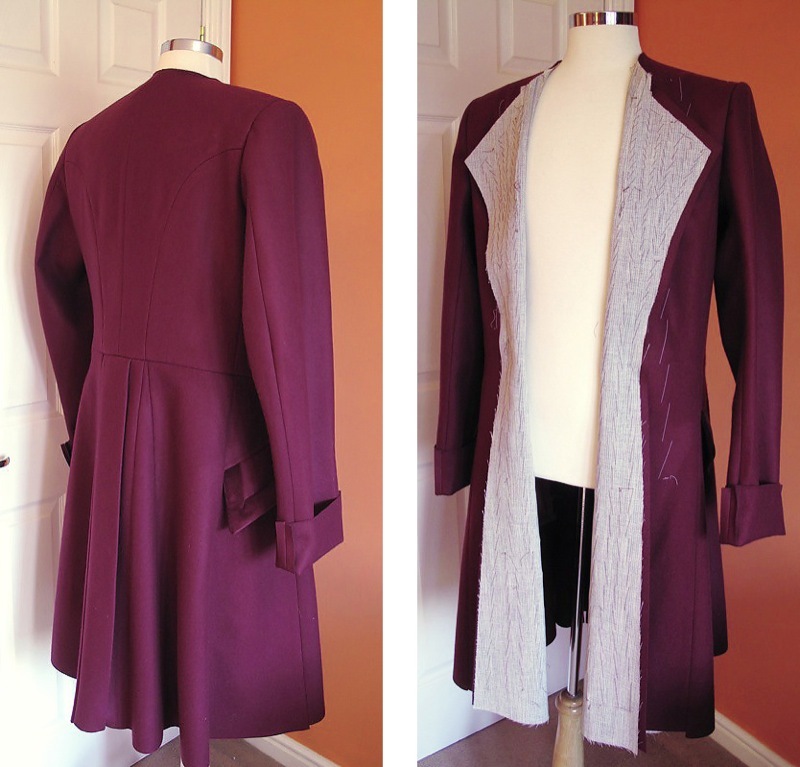 For the front of the coat I need to subtract the area of the lapel facing from the existing area, the remainder being the lining. I took a detailed trace of the lapel facing, and although I am retracing from my coat block, it’s really this first-generation trace I will use as gospel. My sleeve lining is a simple repeat of the coat sleeves, so no work to do there. I now need to cut everything from lining, velvet and felt for the collar. 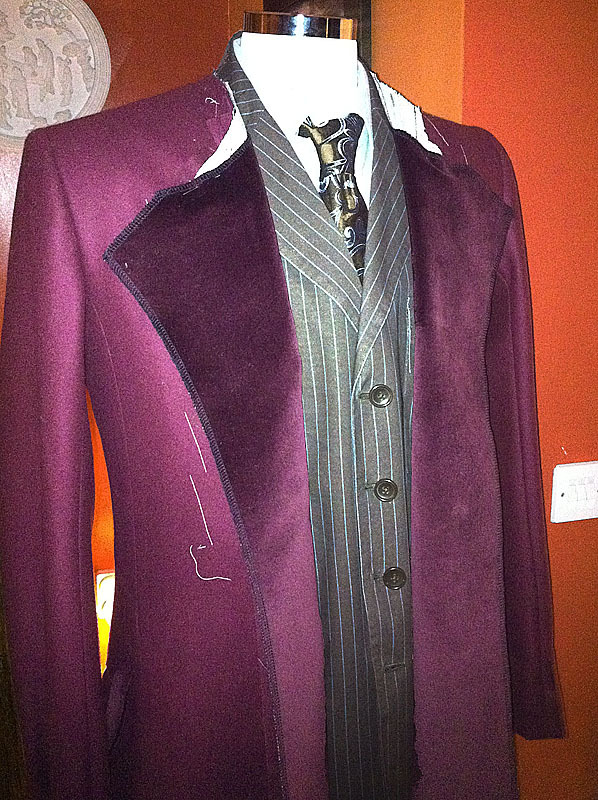 On a gentlemen’s coat it is conventional to cut the collar from velvet, Arthur Daley style. 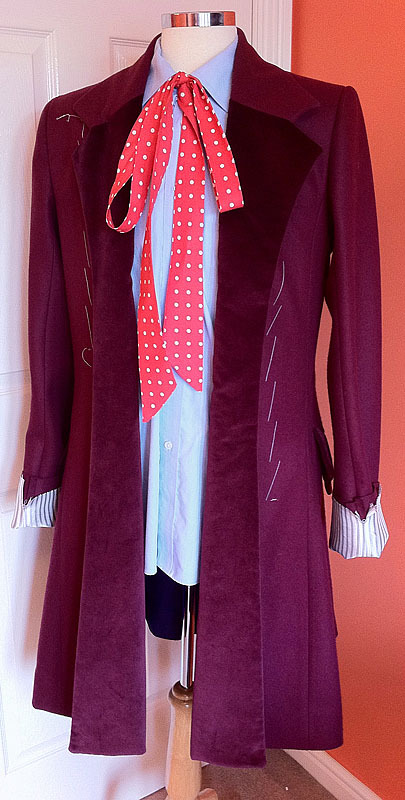 However, I need practice and get experience working with this difficult fabric, so I am pushing myself by making both lapels out of velvet - after all, the pink lapel will be velvet in the finished coat. 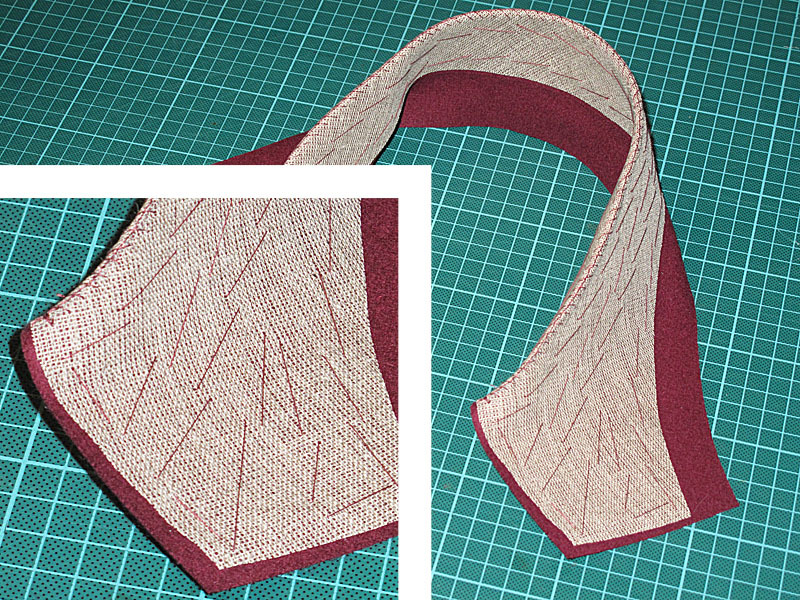 To retain the contrast of fabrics, the collar for my test will be made from the same felt as the body. The collar for the coat is quite tricky to cut, as ultimately it will be made from a checked fabric, so the shape and alignment of fabric will be critical for it to look the same. I took the best pattern trace from the original coat that I could get, and used this to devise the shape. Once patterned, I then cut the net shape in collar canvas; the under collar with minimal seam allowances, except the collar edge; and the upper collar with standard seam allowances, but with extra on the leading edge of the collar point – you’ll see why in a mo. I then pad-stitch the canvas to the under collar as explained in my iPad Stitching posting over on the suit blog. You can see the finished collar here (see right). Skipping forward for a moment – once the collar is set, the upper layer wraps around the canvas, forming the visible shape, with a good one inch lapping underneath (see left). 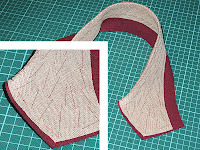 The lower edge of the under collar is laid flat on the neck, and whip stitched in place. Notice how it does not necessarily follow the same line as the upper collar. The lapels are sewn with the collar, and stitched from the notch-point, around the lapel corner and down the length of the lapel to the hem. Once clipped and turned I can get the first glimpse of how the lapels are shaping up (see right). 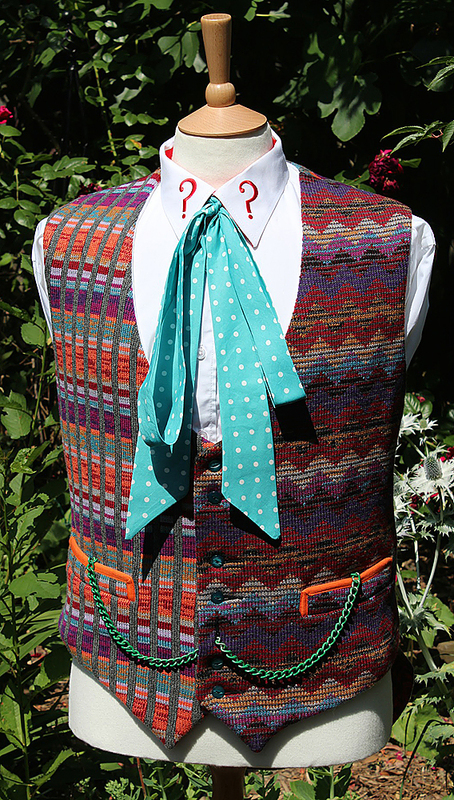 Couldn’t resist adding an appropriate cravat in there, sorry! Before I set the lapel, I did put an inside pocket on each side of the coat. It’s then a pretty simply job to attach the lining along the back vent; hem the coat to length; and close off the collar at the neck line (see right). This essentially leaves just the cuffs to sort out. I must admit I had left these to last as I considered them to be a fairly straight forward pattern and cut job, but they proved to be a bit more tricky than I thought. It is very easy to overlook how the circumference of the cuff on the inside can differ from the outside; and hoe that can change only a few inches further up the sleeve. Suffice to say my first effort was a disaster. the cuff rippled on the inside and it restricted the sleeve further up. After a rethink and re-patterning it I fixed the problems and made cuffs that worked (see left). All I need to do now is attach them and the coat is done! 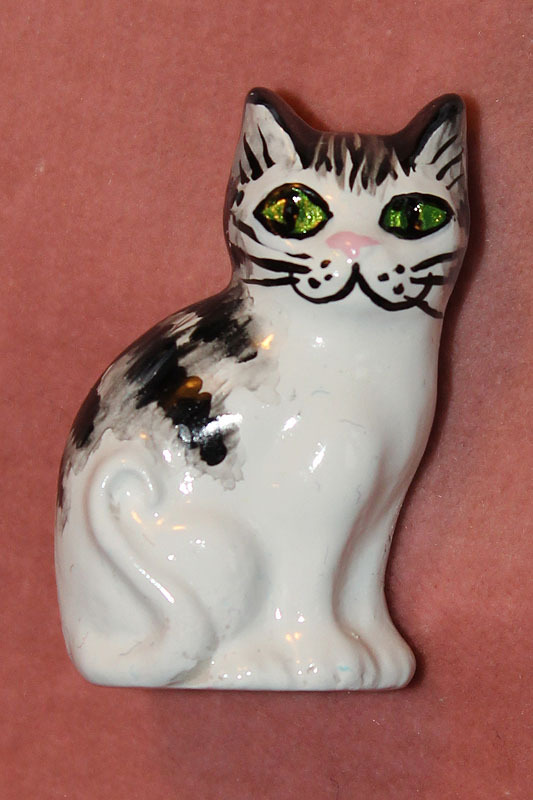 Check back real soon and you can see the finished result – believe me, it’s worth a look!! !